This two color, pink and white azalea, is one of my favorite spring flowers. 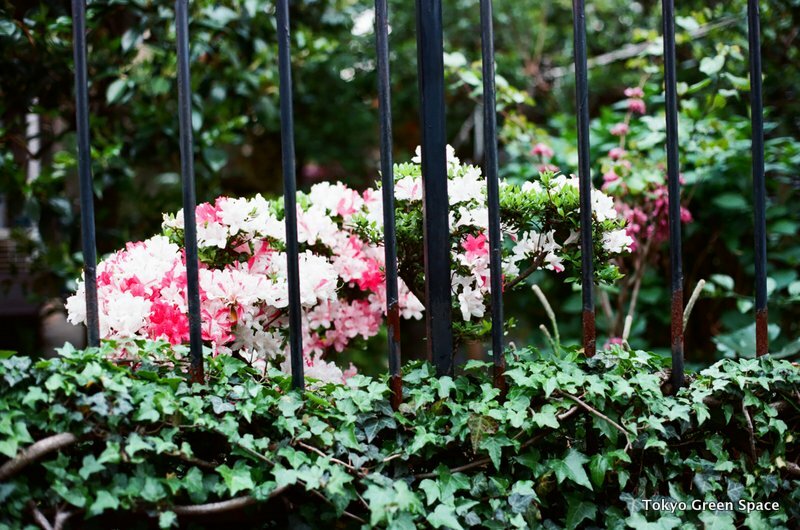 For my first roll of film, I took photos of my favorite gardens in Nakano and Shinjuku, plus my own balcony garden. In the foreground above is Iijima-san’s flower wall house. He has 500 hundred potted plants, mostly flowers, rising from the street to the roof. I interviewed Iijima-san for the Plant Journal article I wrote recently. It’s funny how using a film camera makes the image itself look older. The texture and colors in this image seem so different than the bright and flat images I am now accustomed to seeing with digital images. In the next days, I’ll put up more images from this first roll. I just received my copy of Travel Guide to Aid Japan, a stylish book with 40 artists, writers, fashion designers, and other cultural figures recommending their favorite places to visit in Japan. The WAttention editor had asked me recently for permission to use my Nonbei Yokocho photo, and it’s amazing how fast the book went to print. The foreward is by Alex Kerr and participants include Tokyo’s Jean Snow. I was glad to participate in this book. Biyou yanagi (ビョウヤナギ) is the perfect Tokyo rainy season bush. The flowers radiate with color when the sky is often overcast. Each flower produces dozens of delicate stamen that catch the smallest breeze, and the bush overall seems very hardy for urban life, with very attractive leaves. I think its Latin name is Hypericum monogynum. This one’s growing in the section of my apartment building garden that an elderly couple takes care of. Does this bush grow in your city? Tsuwabuki is a traditional Japanese garden flower in fall. Easy to cultivate and very pretty. I love this Japanese garden flower, called “leopard plant” (farfugium japonicum) in English, or ツワブキ. It has bright yellow flowers in October and November, shiny green leaves, grows and spreads easily in shade, and is a traditional Japanese garden flower. This photo was taken at my friend Takada-san’s stunning garden. It’s awesome that someone has parked their bike illegally in Nakano’s Sun Mall after the shops have closed. Did the bicycle owner leave the potted plant in the basket, or did a stranger deposit it there? The city has a million stories, and this one combines two of my favorite city companions. Google Maps has introduced a new Favorite Places series highlighting global cities with places chosen by local visionaries, designers, museum directors, architects, environmentalists, artists and entrepreneurs. 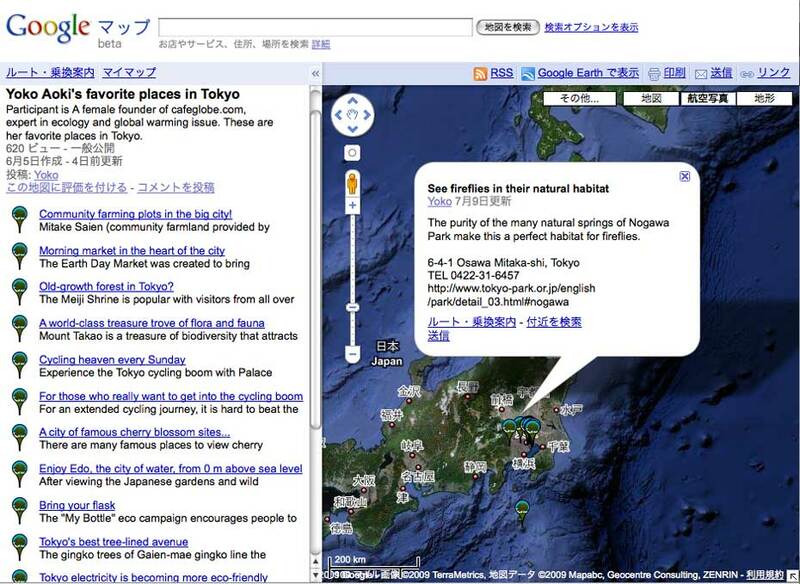 Above is Aoki Yoko’s favorite places in Tokyo and Japan; she’s the founder of cafeglobe.com. Some of her favorite places include urban community farms, old-growth Tokyo forest, a farmers’ market, and a natural springs park that is a firefly habitat. Other Tokyo experts include geek blogger Danny Choo, a flower artist, cameraman, and Shitamachi priest. A very cool introduction to global cities and places you might not know about.